Posing for a team photo - not a bad place to be working! Hello! We’re Stuart, Leila and Kimberley, the three new Ranger Interns at the South Lakes Property. We’re based at Boon Crag, and are living in a lovely little cottage 10 minutes’ walk away. We’re coming to the end of our third week, and have had lots of information thrown at us and met lots of new people. So far we’ve, had a 2 day tour of the property (which wasn’t as much fun for the slightly travel sick member of the group), done fencing, walling, strimming, worked with the South Lakes Conservation Volunteer Group, been on a First Aid course and a Fire Safety Course, and a lot of admin type stuff in between! Throughout the course of the next 8 months we’ll be working mainly with the Hawkshead, Coniston and Woodland Rangers, as well as getting experience with the Upland Footpath Rangers, and helping out on Fun Fridays at Wray Castle and weekend patrols. 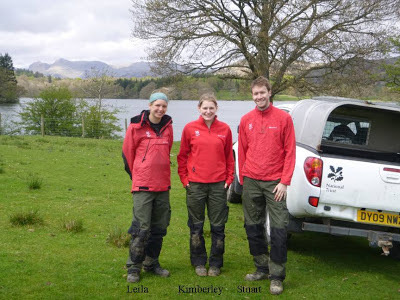 We’re looking forward to the next 8 months here, and getting stuck into all the roles of a South Lakes Ranger. Look out for us and don’t be afraid to come say hello! Red squirrels have seen a major decline over recent years in the UK. This is mostly due to the introduction of the North American grey squirrel. They were brought here in 1876 for ornamental display in the grounds of stately homes. According to Red Squirrels Northern England (RSNE), a red squirrel conservation partnership across the North of England, the UK’s red squirrel population has fallen from 3.5 million to 120,000 since greys were first introduced. In 1930, it became illegal to release a grey squirrel into the wild once the extent of the damage to our own native red squirrel population was realised… So we are mega chuffed that they are beginning to make a comeback! Why are grey squirrels a threat to red squirrels? So how can you tell the difference between a red and a grey squirrel? There are a few notable differences to keep an eye out for. Reds have tufts on their ears most of the year round (apart from a small period of moulting in late summer) whilst greys do not. Their tails are always one colour, compared to the multiple colours on a grey squirrel’s tail. Red squirrels are notably smaller than grey squirrels. Red squirrels have a head and body length of 19-23cm compared to a grey’s 25-30cm. Coat colour is not always the best indicator as colour can vary geographically and squirrels moult twice a year making distinguishing them difficult. The RSNE would love for you to report your red squirrel sightings on their website. See details below. Having a playful time around the Ash pollard in the Basecamp grounds… spot the red climbing up the tree! 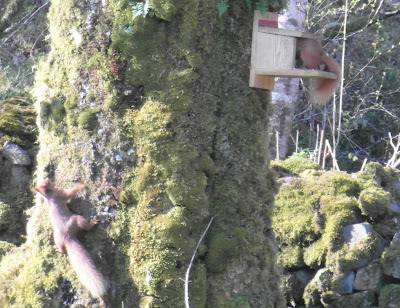 We think it is great that we have more red squirrels around here. 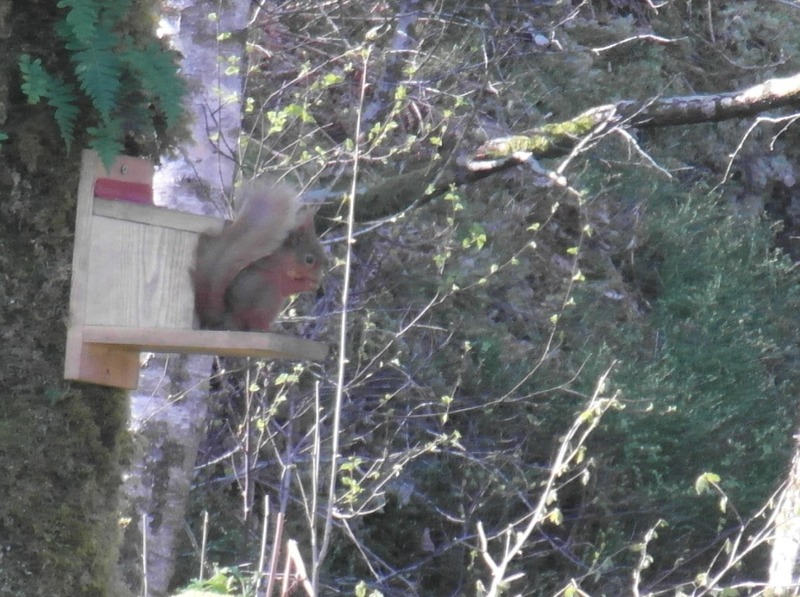 We have plans to film our red squirrels and find out more about what they get up to! Our facebook page is always being updated with the exploits of our red squirrels, so be sure to ‘like us’ to find out more! Search for High Wray Basecamp and Bunkhouse NT on Facebook. 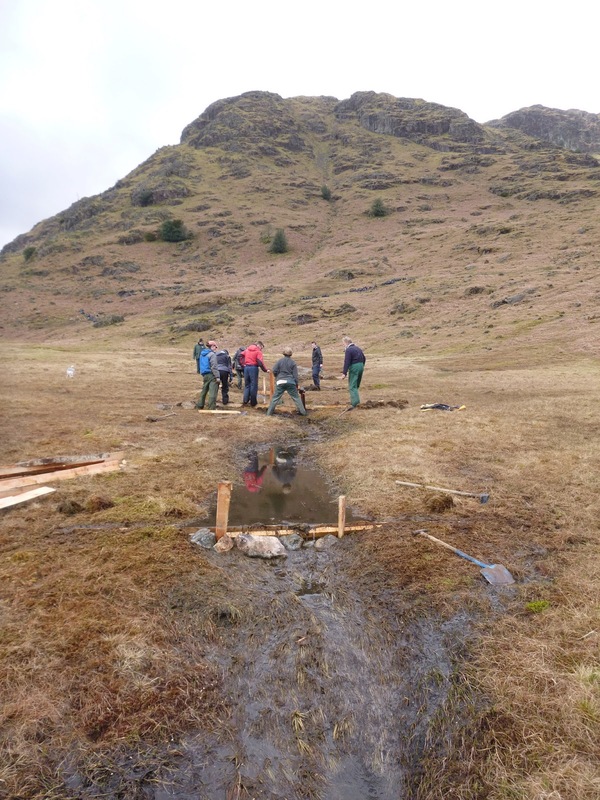 Over the last few months I have been involved in a partnership working project with Cumbria Wildlife Trust and Lake District National Park Authority. 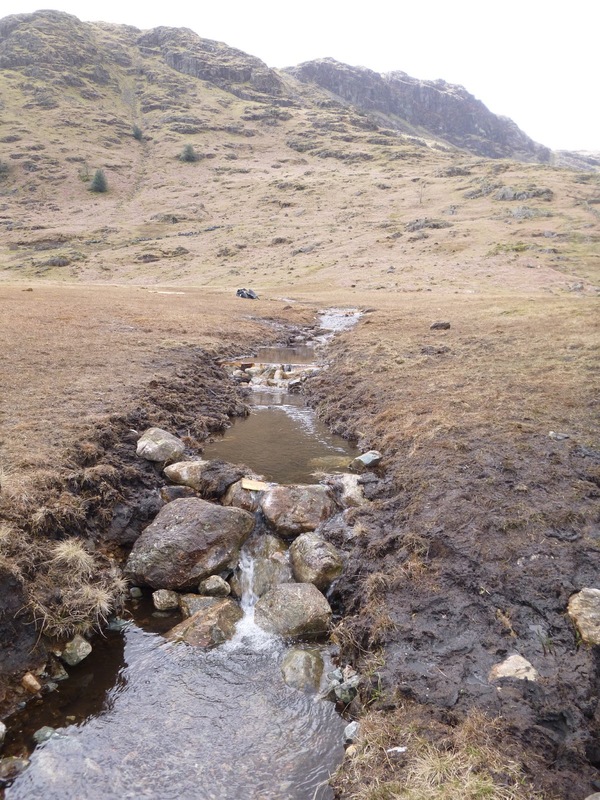 The project was based around Blea Moss in Little Langdale and its focus was to reduce the erosion and drying out of the peat on the mosses. Blea Moss is an important bog habitat and in particular for Bog orchids, Marsh Club Moss and Oblong leaved Sundew, so it is a worthy site for a helping hand. Stone dam to act as a silt trap and slow down the water. The project is covering peat erosion on both the moss area and the surrounding footpaths and is being worked on by a number of groups and organisations including our own National Trust basecamp team and the Upland Footpath team with volunteering students from Kendal College. Alec hard at work building a dam from larch boarding. 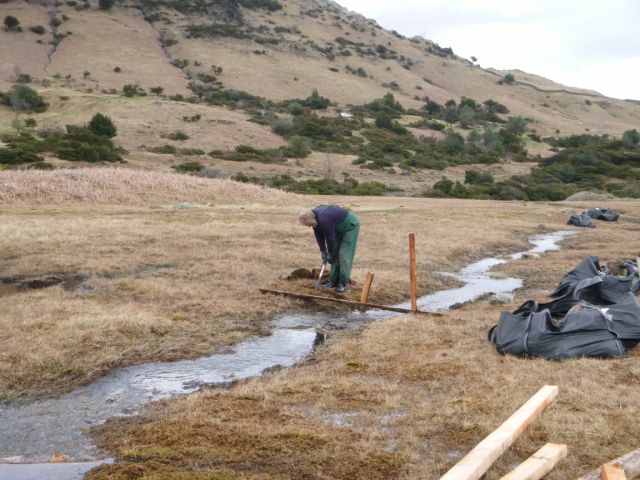 There has been a week of volunteering on the project and on Monday I was there with Stuart and the South Lakes Conservation group, we had a great day, making lots of Dams and getting pretty wet in the process. Dam building seemed to be a popular task for our volunteers to sign up to, I wonder why? Possibly because it gave us all a chance to be big kids and build dams.. Whatever the motivation of all those that came, it was a very successful day with lots achieved. How many big kids does it take to supervise? The rest of this week there has been volunteer days from the Lake District National Park volunteers and from Cumbria Wildlife Trust, the dam phase of the project is almost complete. What a week of work, and we were lucky with the weather too!